Pizza works for any meal. The one that is most at odds with the sensibilities of many people is eating pizza for breakfast. Now, you may think I mean the morning after room temperature (or refrigerated if you're lucky) pizza after an all night bender. No, I'm talking about a pizza made specifically to eat in the morning. Part of the pleasure is certainly in the pizza itself. 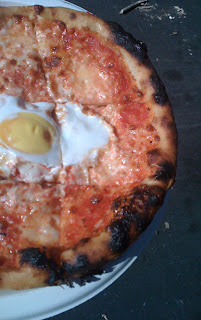 But another bonus is breaking the yolk and using the pizza to sop it up.